Tablets are an exploding market. As a marketer, it’s important to understand how this combination of a light alternative to a laptop and a personal leisure device is used, how it changes content consumption and advertising, and how it fits into consumers’ lives relative to other connected devices –namely computers and smartphones. 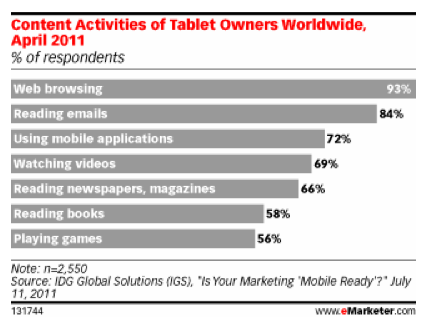 Tablet users are expected to reach 54.8 million by the end of 2012 and to grow to 89.5 million by the end of 2014 based on eMarketer’s forecasts. 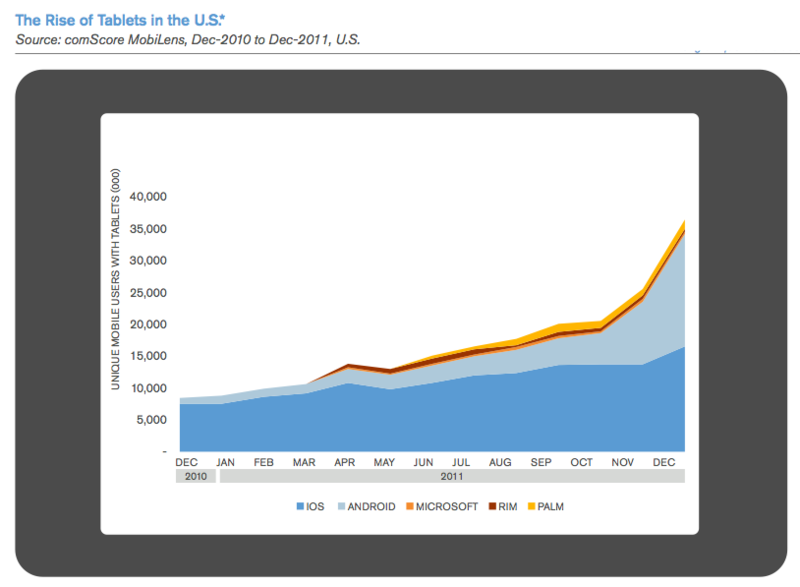 While tablet ownership is projected to increase steadily through 2014, the rate of increase will slow as the market matures. 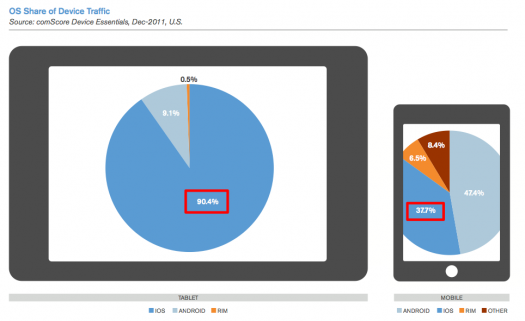 Tablet ownership has outpaced smartphone ownership in the US. Roughly 40 million tablets were used by mobile subscribers in less than two years based on comScore data, an adoption rate that took smartphones seven years to reach. Expanded tablet options with different features and price points, including Amazon Kindle Fire, and Barnes & Noble NOOK, have contributed to the tablet’s increased popularity. 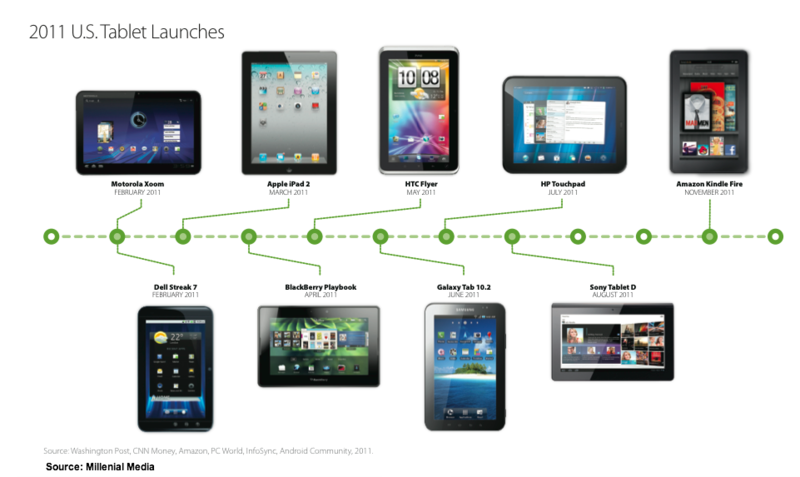 To understand the tablet landscape, here’s a 2011 product introduction timeline via Millenial Media. Having created the first tablet, it’s no surprise the Apple’s iOS system has the lion’s share of the market – over 90%. As other, less expensive options gain public acceptance, this share is likely to approximate that of the smartphone market at roughly 40%. Of course, this will require that Apple continue to create wow improvements to stay ahead of its lower priced competitors. One area where tablets differ from mobile phones is in terms of Internet connectivity. While two out of five mobile phone owners used wifi connections to access the mobile Internet in December 2011, nine out ten tablet owners used wifi connections to access the mobile Internet. Before jumping to conclusions about connectivity, understand that mobile web data plans add an incremental monthly cost when free options are available, especially depending on where the user is when he needs mobile Internet access. For consumers, tablets are an additional connected device. They don’t replace mobile phones or computers. 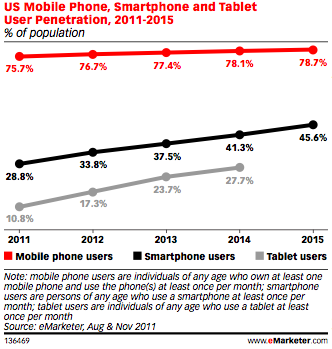 In the US, about 14% of mobile subscribers own a tablet. Tablets tend to be individual devices. Based on Nielsen findings, about half of tablet owners are the only person using their device, 43% shared their tablet with others, and 8% own a tablet but they don’t use it; other members of their household do. 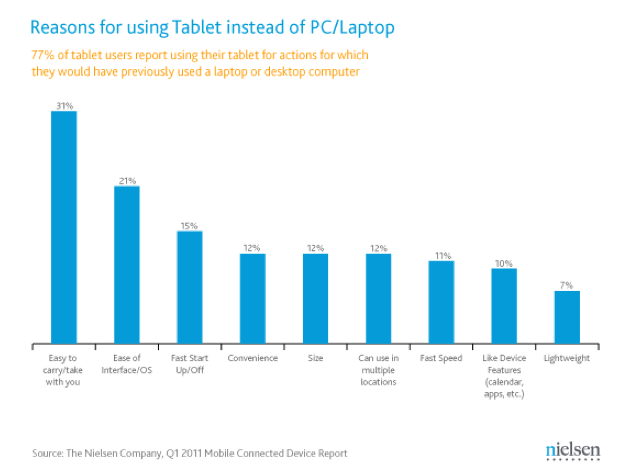 Further, tablet owners who owned a desktop computer, used it about one-third less since getting the tablet. 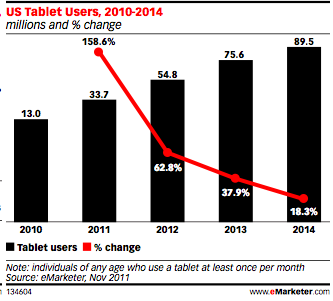 The most cited reason for the change in usage patterns is the tablet’s portability. Owners with children find there’s a silver lining to their latest tech toy. It’s a great babysitter. Download a game or a movie to keep your kids quick and amused. Based on research from Nielsen in the third and fourth quarters of 2011, 70% of tablet use is in the home, where many consumers already have wifi so there’s no need to pay for additional services. 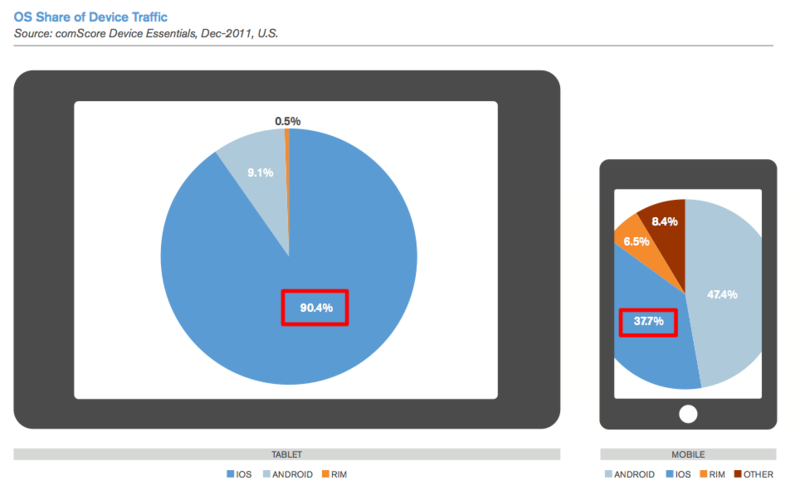 To understand how tablets are used through out the day relative to other connected devices, this comScore research provides insights. 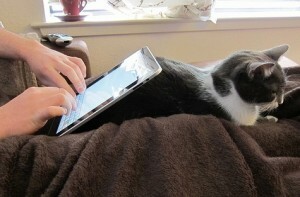 Tablets are a personal use device. Usage peaks in the evenings during the week and in the mornings on weekends when owners have time to spend focused on their personal needs and interests. While mobile phones, namely smartphones are on and used when owners are awake. 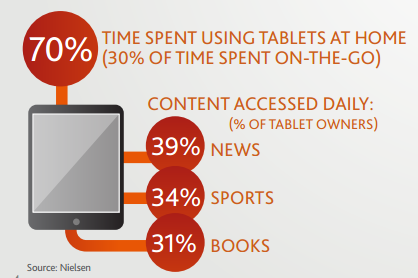 Consumers use tablets for concurrent consumption from multiple sources, especially television. 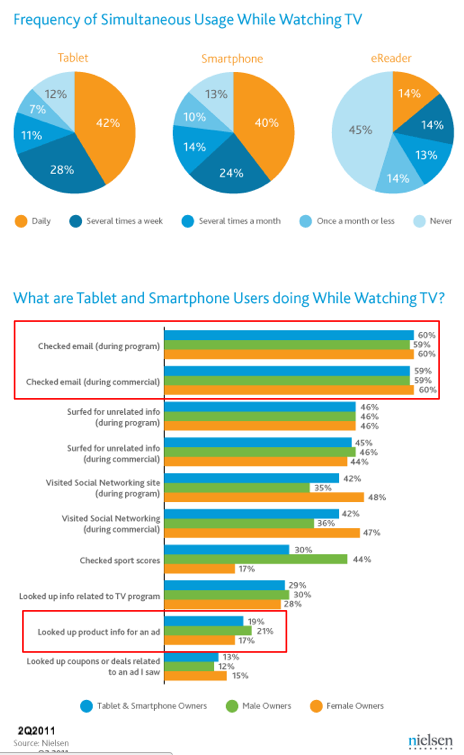 Based on Nielsen’s data, over 40% of owners view their tablets and television together daily. What are consumers doing with their tablets? Reading email! This should be no surprise since smartphone owners spend most of their time on email as well. We’re all looking for ways to reduce email clutter. For marketers, there’s a bright spot. 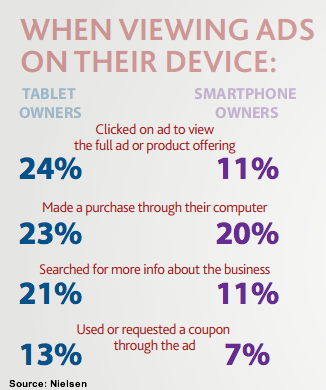 About 20% of tablet owners seek information related to an ad. 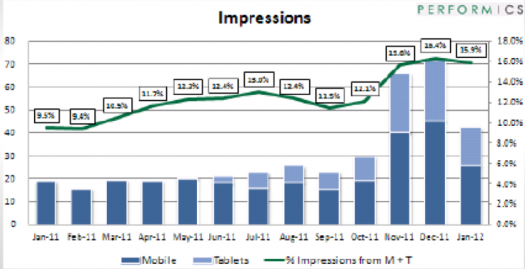 Tablet search: According to Performics, tablets accounted for 38% of mobile search over the last three months. Mobile applications (aka apps) provide an alternative method of navigating and consuming content. 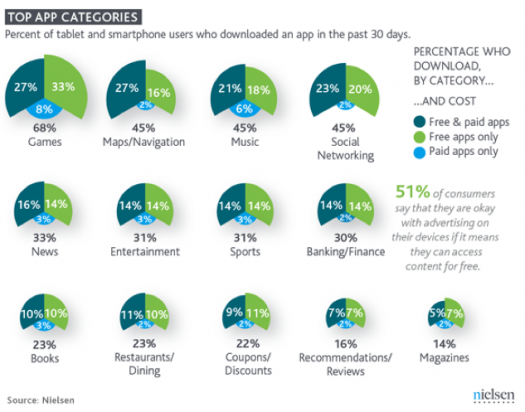 Most users (95%) have downloaded and use less than ten apps on a regular basis. When it comes to apps, regardless of category, US consumers prefer to get their apps for free. 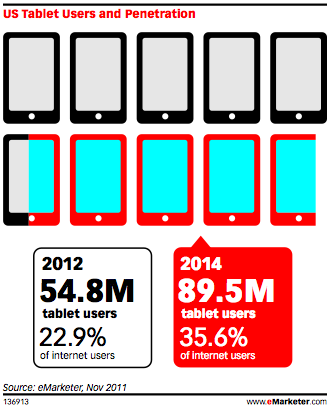 There’s no doubt that tablets encourage content consumption, regardless of type. The tablet’s given new life to offline media including videos, newspapers, magazines and books. Since consumers turn to tablets for content, marketers should find it positive that one in four owners is likely to click on the ad to view the full product page and seek more information. Further, with regard to advertising actions, tablet owners are more engaged than smartphone owners. 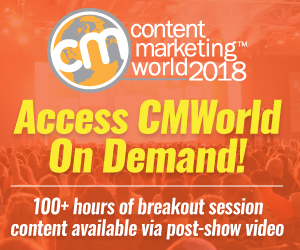 Of course, marketers should bear in mind that this may be related to where they are and the time they’ve got to interact as well as different advertising formats on tablets. 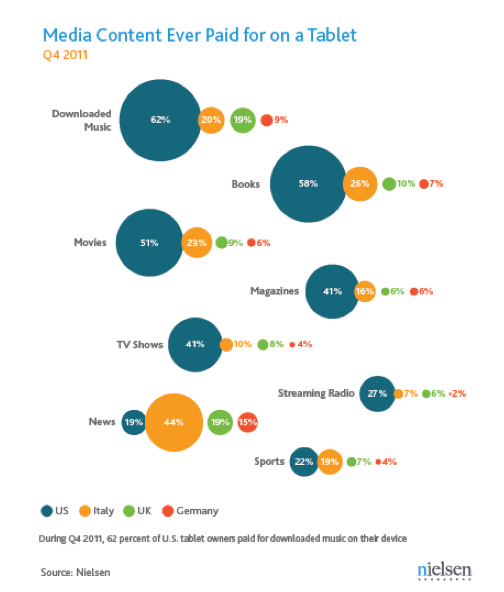 On a related note for content marketers seeking to generate revenues from their content, most American tablet owners have purchased entertainment in the form of music and books for their tablets. Tablets are a personal connected device that owners use as a easy-to-carry, light-weight alternative to a laptop, making them useful for commuters and business travelers as well as for personal time. 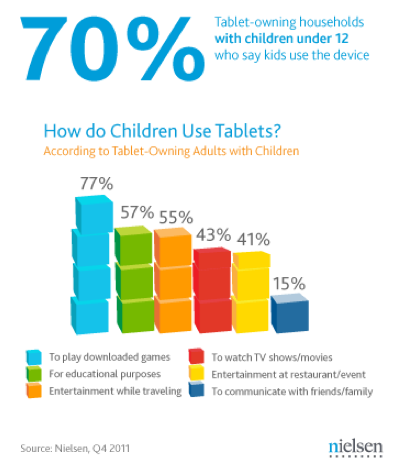 Tablets are an additional device that can be used in conjunction with another device or alone. Tablets enable owners to consume long format content such as video, magazines, newspapers and books, which require longer attention spans than smartphones. As a result, consumers are more engaged with the content and the related advertising. Now is the time for marketers to start testing this device to understand the implications for content and advertising. 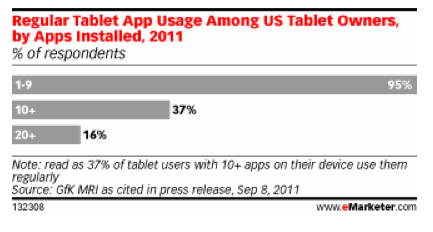 Have you developed content and/or apps for tablet usage? If so, what was your experience? 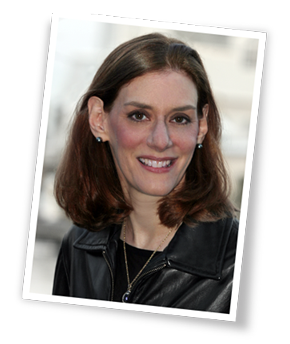 Tags comScore, eMarketer, Millenial Media, Nielsen, Research, Tablet. Bookmark the permalink.